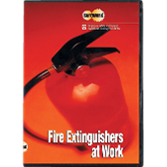 Teach correct fire extinguisher use and comply with OSHA. Show NFPA®'s Fire Extinguishers at Work Video! NFPA's acclaimed Fire Extinguishers at Work Video gives employees the vital skills they need to protect themselves and your facility -- while your company meets OSHA 1910.157, the training mandate for portable extinguishers. Provide a firsthand look at extinguisher operation in action. Live-action demonstrations of different types of fires and fire fighting techniques show employees what to do -- and what not to do -- when confronting fire. Instruction is based on the procedures in NFPA 10: Portable Fire Extinguishers, the Standard referenced by OSHA in creating its workplace safety training regulations. Every second is packed with facts industrial workers need to know! Detailed step-by-step instructions and helpful safety precautions for handling different types of emergencies -- from electrical equipment fires to flammable liquid fires and combustible spills. Watch NFPA®'s interview with Lori Gicewicz, Director of Marketing at BullEx Digital Safety in Albany, NY, to hear why BullEx uses NFPA's Fire Extinguisher at Work Video as part of their training programs.